More than £1bn was wiped off the stock market value of the government contractor Capita on Wednesday, sparking fears of job losses and forcing Downing Street to play down the threat of a collapse echoing the demise of rival Carillion. Capita, whose major contracts range from collecting the BBC licence fee to electronic tagging of prisoners, saw its share price nearly halve in a day following a grim financial update that reignited concerns over the outsourcing industry and the stability of public services, reports The Guardian. The prime minister’s spokesman insisted Capita was not in a similar position to Carillion, whose collapse earlier this month plunged thousands of workers and small businesses into uncertainty. 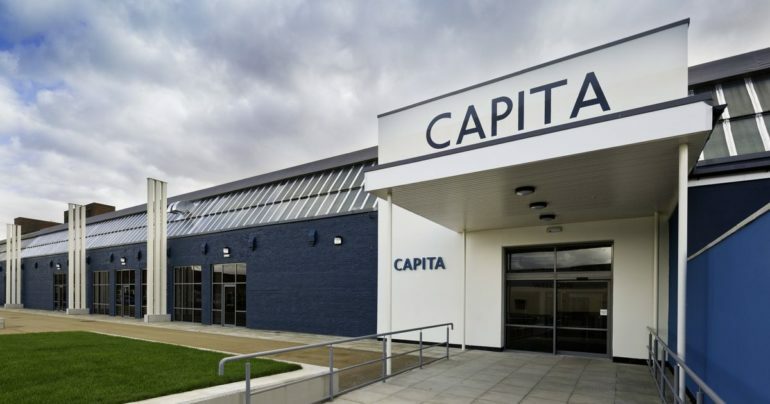 Capita’s shares plunged 47.5%, cutting its stock market value by £1.1bn, after new chief executive Jonathan Lewis stunned markets by admitting the company’s finances were in a dire state and announcing drastic measures to repair them. Lewis, appointed in October last year, downgraded Capita’s profit forecasts and announced plans to raise £700m to shore up its balance sheet. He also axed a dividend that had been worth more than £500m to investors over the past three years. A cost-cutting programme is expected to result in job losses among Capita’s 67,000 employees, 50,000 of whom are in the UK, while parts of the business will be sold to raise cash. Within 10 hours of its statement to the City, Capita’s stock market value had fallen to £1.2bn, with a £381m pension deficit and debts predicted to hit £1.15bn by the end of the year. Lewis said the company, which has grown rapidly through a string of acquisitions, had become “too complex” and admitted the firm was lacking in discipline. The measures announced by Lewis are likely to be interpreted as pre-emptive action to ensure a profitable future at a challenging time for the outsourcing industry, signalled by Carillion’s collapse. The outsourcing model involves the government farming out public sector work to private companies. Like Carillion, Capita counts the UK government among its major clients with contracts that include running London’s congestion charge scheme, tagging prisoners, operating a jobseeker’s allowance telephone line and administering the teachers’ pension scheme. It also collects the licence fee for the BBC. Labour said the government should take steps to oversee the activities of Capita. “The Tories’ privatisation dogma risks lurching our public services from crisis to crisis, threatening jobs, taxpayers’ money and leaving people without the services they need,” said Jon Trickett, the shadow minister for the Cabinet Office. Frank Field, chair of the work and pensions committee, said it would be looking into Capita. In a statement that referred to the accounting group that signed off Carillion’s figures, KPMG, he said: “Another day, another outsourcing firm with massive debt, a huge pension deficit, a KPMG audit and the big four popping up at every turn in the company’s chequered history. Some City analysts said Capita still had plenty of time to avoid the fate of Carillion. David Madden, an analyst at City firm CMC Markets, said the action from Capita was “a red alert” for investors but added that it “could turn itself around”. “Carillion collapsed but Capita is still in the game,” Madden said. Frances O’Grady, the general secretary of trade union body the TUC, said the profit warning from Capita was “really worrying” and urged the government to act. Lewis said the measures announced on Wednesday were the “first steps in the road to recovery,” predicting his turnaround would take two years. Capita said it was also undertaking a triennial review of its pension scheme and expected its pension deficit to reduce from the £381m level at the last assessment in summer 2017 as a result of increasing contributions. Its former rival Carillion has faced criticism for continuing to pay dividends and big executive salaries as debts mounted, eventually leading to a collapse of the company earlier this month. The work and pensions committee on Wednesday wrote to former investors in Carillion and HM Revenue & Customs as part of a wide-ranging inquiry into the company’s collapse. The committee asked former shareholders, including major financial institutions BlackRock, UBS and Deutsche Bank, for opinions on how the company was run and why they chose to sell shares when they did. The committees also asked the Federation of Small Business to provide an overview of Carillion’s payments to suppliers and wrote to Santander bank to ask about reports that it stopped payments to some Carillion suppliers without notice in December. HMRC has been asked about Carillion’s performance in paying tax and the firm’s total outstanding tax liability.